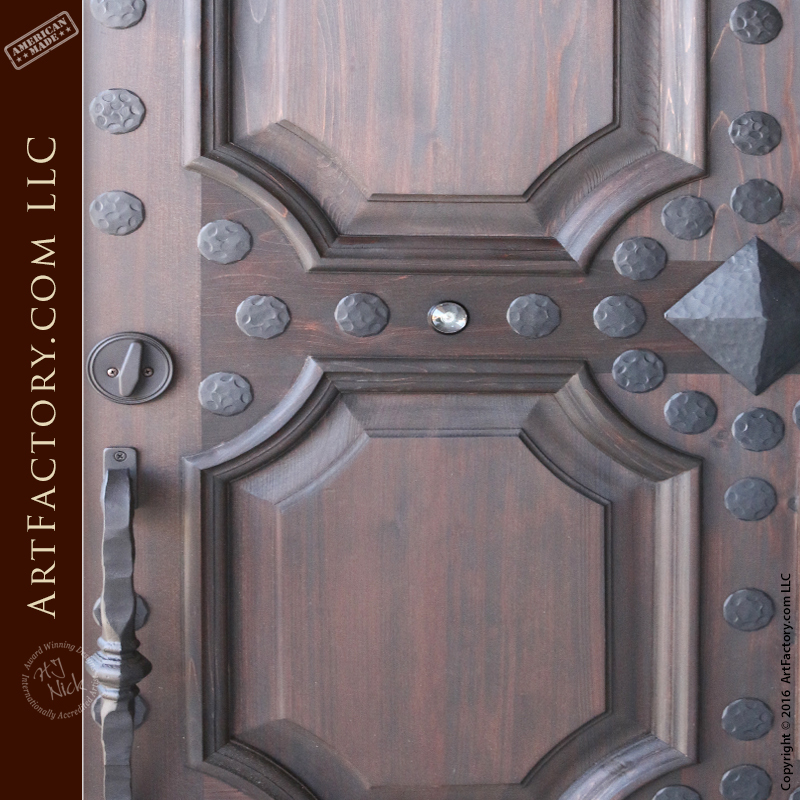 At ArtFactory.com we specialize in fine art quality, hand crafted front doors. It is our believe that when building an entrance door, that one should not have to sacrifice style for security. That is why we build entrances that combine fortress strength security, and fine art quality design. 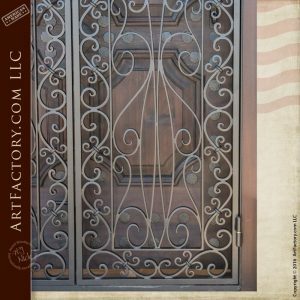 This custom door features a detailed, hand forged wrought iron security grill that opens separately from the solid wood entrance door. We build all of our wooden doors exclusively with solid, full length, naturally air dried timber that is hand hewn with mortise and tenon joinery. This type of construction and materials ensures that you door will provide both maximum security and durability. Furthermore, all of our wooden doors are finished using a hand rubbed, multi-step process that blends the stain into the grain of the wood. We have over 400 designer stain colors to choose from, and can also match to any existing sample. These finishes, and all aspects of each product are certified to fine art quality by award winning atist H.J. Nick, who oversees the design and construction of every product built in our factory. This signature ensures that your custom door is an investment quality product with future appreciable antiquity value. The centerpiece of this entrance, without a doubt, is the intricately detailed ornamental custom security grill. 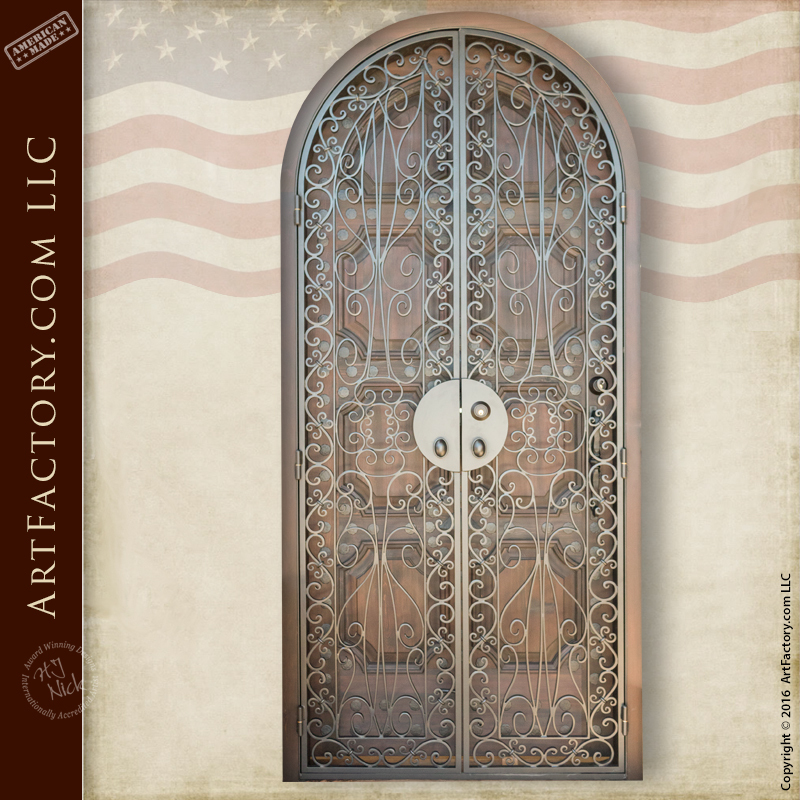 Designs such as these intricately designed doors are a trademark of our master artist, H.J. Nick. 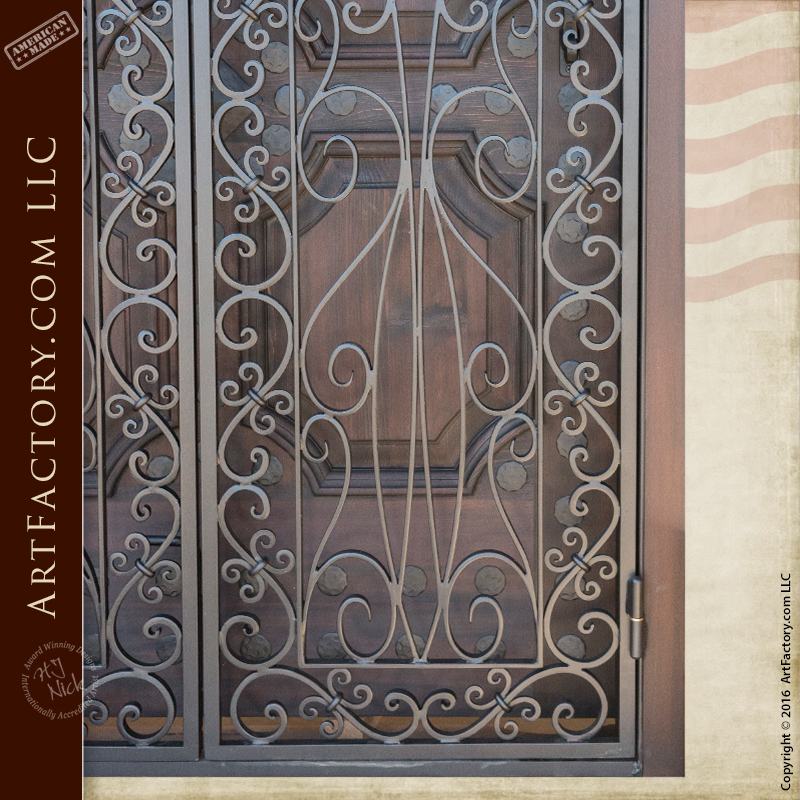 All of our custom security grills and door hardware are built with solid, blacksmith hand forged wrought iron. Our master blacksmiths use hammer and anvil to build wrought iron door grills over a coal fired forge. We build custom hardware with pure wrought iron, because wrought iron lasts for centuries with little or no maintenance, builds a patina, and only looks better with age. In other words, our custom grills and hardware are built to stand the test of time. 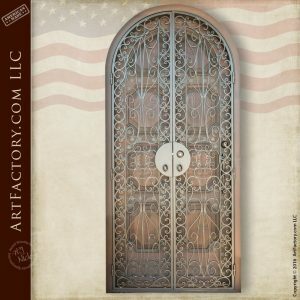 In addition to the custom grill, this custom decorative security door features hand forged wrought iron hinges, custom decorative clavos, and and artistic fine art quality door pulls. All of this hardware is built using the same techniques that have been used by master blacksmiths for centuries. Finally, all hardware products are advance patinated using a hand applied, heat infused, iron-oxide process that bonds the patina to the metal for a lasting finish. 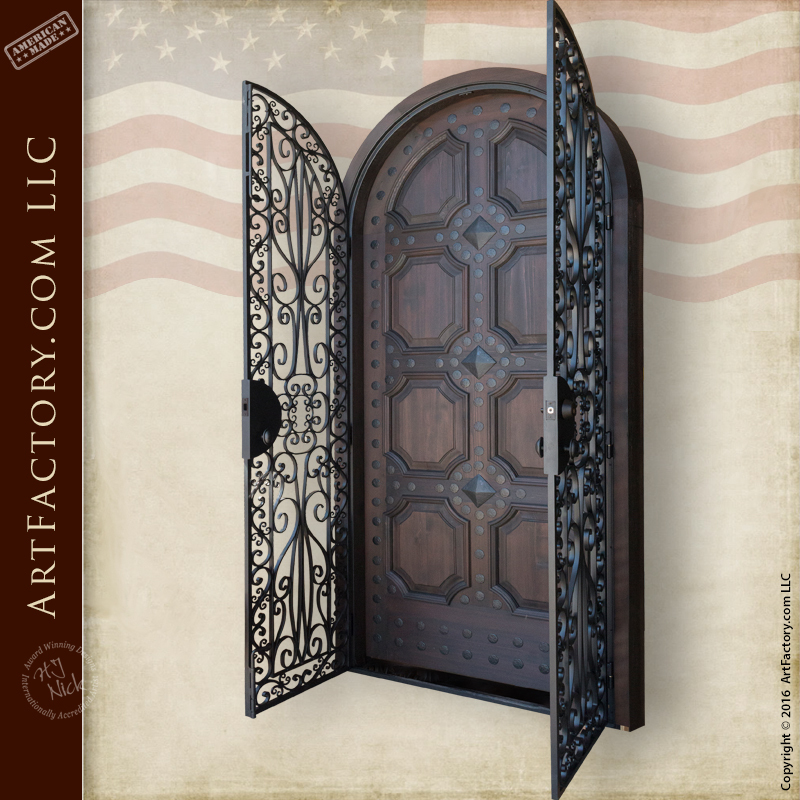 First of all, the custom decorative security door is built to fortress strength. Additionally, we build to investment quality and fine art standards. Were so confident in our fine craftsmanship and the durability of our products that, as a result we guarantee everything forever. We design all of our custom doors for either your residential, or commercial property. (All doors are pre-hung in a structural solid wood jamb that can be mounted to a typical metal store front.) We also make any of our custom door designs as custom gates or custom garage doors. Make a proper first impression that reflects your personality and accomplishments in the same way kings, queens, and other aristocracy have done for thousands of years. Request a quote for your dream custom decorative security door today. ArtFactory.com offers only the finest quality, artistic signature doors and entrances. Most importantly, our expert craftsmen, wood carvers, and metal smiths individually create each fine art door to your exact specifications. We have no limitations on size, design, thickness or finish. Additionally, we are proud to build 100% of our products in the United States of America, right at our Scottsdale, Arizona factory. We hand make interior and exterior doors in any style, limited only by your imagination, and guaranteed to last! All or this, and to top it all off, these are virtually maintenance free doors that more than surpass all hurricane codes. Our custom decorative security door is designed to provide maximum security that will stand the test of time. Contact us to discuss your designer door ideas at 1-800-292-0008.